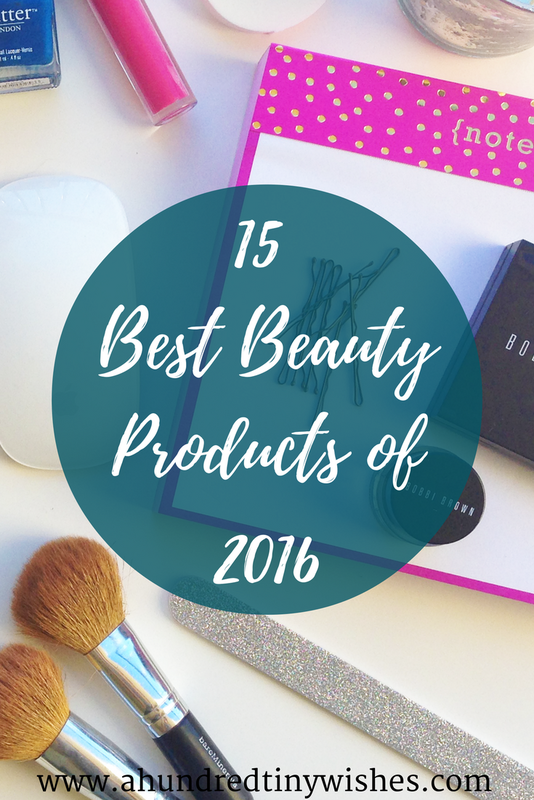 Even though we are already two weeks into 2017, I have to say 2016 was a great year for new beauty products. Even though I broke up with my subscription boxes in July, I was able to work with a few brands and sample a lot of products from Sephora. 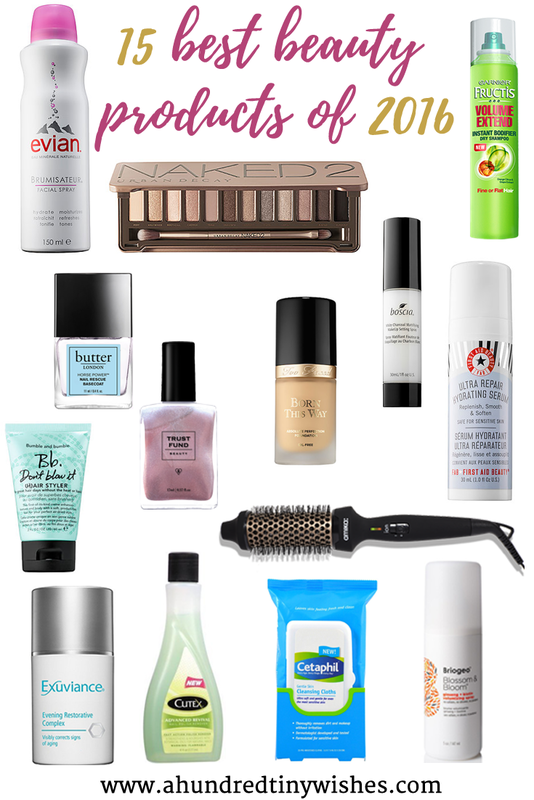 In the end, I found so many hair, nail, makeup, and skincare products that I loved. Fifteen of those products that I tried in 2016 have either became my HG products or have been integrated into my daily routine, and today I want to share those with you. I had been looking for a cheap dry shampoo and stumbled upon the Garnier Fructis. It works perfectly, doesn't leave a residue, and smells great. I can't even begin to tell you how good this stuff smells- it's like a mix between orange and tangerine. I discovered this in the summer and fell in love immediately. It's the perfect leave in for no-heat styles, and helps tame all of my fly-aways. I had my eye on this brush for a rather long time, and when I finally splurged on it, I was very surprised. It's not a dryer brush, but rather a heated brush that helps with smoothing and end curling. I use it in place of a flat iron, and it feels healthier on my hair. I'm a pretty big fan of Boscia products, and I loved how hydrating this setting spray was. It's also didn't have a smell, and kept my makeup in place. The Naked2 was my first UD palette and I feel in love instantly. I love the variety of neutral colors and the pigment of the shadows. I had never been a foundation person until late in 2016. I decided to give Too Faced a try, and it worked so good with my complexion. It's oil-free and provides medium to full coverage. I started using the complex at the beginning of December and loved it. It's feels wonderful on my skin, is more of a gel like cream, smells like a cross between green apples and watermelon, and when I wake up in the morning, my face feels hydrated. Formulated without parabens, sulfates, and phthalates, this powerful cleansing mist removes sweat with calming, soothing benefits to prevent dry skin and breakouts, removes harsh chemicals like chlorine that can damage facial skin, and hydrates throughout the day. It also instantly soothes and re-hydrates sun-burned or wind-chapped skin, leaving a beautiful & radiant complexion. Bonus: it's convenient to just throw in my bag and go & it won't mess up my makeup. This product is my holy grail product of any season. Cruelty-free and safe for my sensitive skin, this serum is so moisturizing. The signature ingredient, colloidal oatmeal, along with aloe leaf juice is formulated to calm and soothe irritated skin for an allover healthy-looking complexion. I knew Cetaphil had a rep for being great for sensitive skin, so I decided to give them a try. I loved them immediately. I have a tendency to use wipes on my face at night for two reasons: I'm lazy and don't feel like washing my face, and I'm tired, so finding a good cleansing wipe is essential. The Cetaphil wipes don't have a weird smell, they are gentle on my face, and my face feels clean and refreshed! skynIceland is becoming one of my favorite brands; not only are they cruelty-free, but every product that I have tried from them, I have loved. The Under-Eye Illuminator is no different. I have some bags and believe it or not, I have some fine lines under my eyes; and the Illuminator makes my under eye area look like I'm 20 again. The formula hydrates, reflects light, and bonus: doesn't irritate my eyes! Hands down, my FAVORITE basecoat ever. I contribute this stuff to helping me kick my nail biting habit in 2016. It strengthens, helps polish stay on longer, and if left on by itself, makes my nails look shiny. I had been looking for something that would be great for my nails, and didn't smell bad. What I found was the Cutex Advanced. It strengthens with botanical oils, doesn't smell horrible, and doesn't leave a residue. Every year I fall in love with a new nail polish color, and in 2016, I fell for a beautiful rose gold pinky color from Trust Fund Beauty; which is also vegan and cruelty-free! What were your best beauty products of 2016?